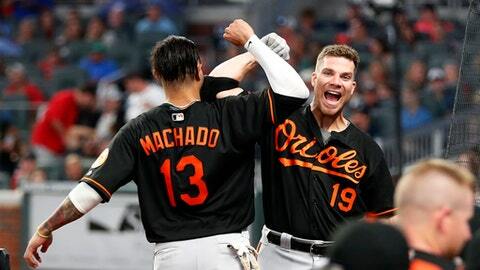 ATLANTA (AP) For Braves manager Brian Snitker, playing the matchups meant pitching to Manny Machado with first base open and a marathon game on the line. Peter Moylan, Atlanta’s eighth pitcher, hit Craig Gentry to open the 15th. Gentry moved to second on Austin Wynns‘ sacrifice. Mike Wright Jr. (1-0), Baltimore’s seventh pitcher, threw two scoreless innings. Ozzie Albies‘ bases-loaded single drove in Camargo. Freddie Freeman’s two-run single cut the lead to one before Nick Markakis tied the game with a double to right field. Orioles: OF Trey Mancini (stiff neck) struck out as a pinch hitter in the eighth. He did not start for the second straight game. … INF Tim Beckham (core muscle surgery) could return Monday. He has been out since April 25. Braves: RHP Mike Soroka was placed on the 10-day disabled list, retroactive to Wednesday, with right shoulder inflammation. It is the rookie’s second DL stint with the shoulder issue. He missed 24 games from May 17 to June 13. He allowed four runs in 4 2/3 innings and his velocity dropped in the Braves’ 11-4 win at Toronto on Tuesday. Santana was recalled from Triple-A Gwinnett. … RHP Mike Foltynewicz (right triceps tightness) threw on the side without problems and could come off the DL to start Monday against the Reds. As part of the team’s celebration of Hank Aaron this week, the Braves wore 1974 throwback uniforms. ”I think the break was obviously more just to give me an opportunity to sit down and try to make some of these adjustments and not have to go out and do it in the game,” Davis said.